RESERVE YOUR SEAT FOR £97 Because YOU are Worth It! No names are given for testimonials as this is a very confidential course. It has been scientifically proven that HAPPINESS fuels a successful life, not the other way round. Unfortunately, we don't get to attend a happiness class in school and generally we make it up as we go along. However, happiness is like maths, there are strategies to follow. So, if you find yourself at a crossroads, you want more from life or you are currently facing personal challenges, this course is for you. If you would like to speak to me directly to check if it is for you, my number is 07989658604. Please call between 9am and 5pm. Start your day with a positive state of mind , every day. Most people don't do this! Create the life you want by keeping your mind OFF what you don't want and ON only what you DO! Sounds common sense but most people don't do this either! Use the visual part of your brain to create lasting happiness and success. Most people have no idea how their visual brain is impacting their successes or failures in relationships, work, business and health. This course is ideally suited to a professional person or someone who is in a state of change in their life, such as, a redundancy, divorce, health issues, children leaving home etc..
Life changes, we can’t stop that, but when we know what to do we can enjoy it. Without new knowledge and actions, change can be very stressful, creating anxiety and sometimes depression. Best to know how to avoid these time-wasting emotions. This is an evening event, from 6.15pm - 8.15pm each week. NOTE - The ticket price includes VAT. Janet specialises in the visual part of the brain as a tool for creating more happiness and fulfillment. Janet will introduce the power of using visualisation as a tool for achieving a happy and healthy life. This is a time-tested strategy that few people are aware of. Janet will also explain that emotions linked with life’s challenges, such as anxiety, stress and depression, are normal emotional responses to life. New information, tips and techniques are required to create a new vision in order to overcome and prosper from life’s challenges. Understanding how life is always a transfer of ‘chaos to order’ and has several ‘life’s cycles’ that we all go through, brings the ability to make different choices and create different and better results, rather than remain in the fog and reacting to life. The answer to a better life is to create a balanced R.I.C.H Life, a life of great Relationships, Income, Confidence and Health. In the personal development world, it is widely known that we create our external life based on our internal world of mind, body and spirit. Janet will teach the power of self-observation, as that is where the changes need to be made first. The self-observation will be focused on how people currently are in the four pillars of life, their Relationships, Income, Confidence and Health habits. What do you believe about you and your world? We will then discuss the six-basic fears and how they affect people’s lives and get in the way of making dreams come true. This week you will learn to understand the power of the visual mind and the influence it is having without you knowing. You will discover the importance of using the visual mind, inner dialogue and self-belief to focus on what you want and make it happen. Some things don’t need goals; in fact, sometimes goals can be a hindrance. Take getting fit and dieting; the tendency is that once the set goal has been achieved behaviour reverts back and people get unfit or put weight back on. This result is very common. The simple answer is to stop the behaviour that is causing the problem and create a new behaviour with no goals, as this is to be a life-changing result. We will discuss tips for that. However, setting goals to change a situation works and is VERY empowering. This kind of goal setting creates healthy chemistry in the brain and leads to greater happiness, as achievement releases dopamine in the brain. Dopamine is an essential chemical that creates a sense of fulfillment from reward and achievement. You will learn all about the Happiness Head Chemistry and discover simple ways to create it. We will cover planning and the different types of planning strategies that are available and their benefits to creating balance and calm. It isn’t possible to know how happiness rich or poor you are until you identify what is in your bank account and learn new ways to make deposits. It is, of course, a metaphorical bank account but it plays a very important part in creating a happy, fulfilled and successful life. There will be times in life that we are making great deposits, such as a new baby arriving and times when we need huge withdrawals, such as the death of a loved one or faced with a challenging situation. We will also discuss the cost of emotional overdrafts of the Happiness Bank Account. This account works in just the same way as a money account; it is just a different currency that is involved. When we see happiness and emotional well being as a valuable asset, we take greater care of it. Happiness Bank Account discussion and the group’s response to creating this account. Open discussion of where you were at the beginning of the course and how much progress you have seen during the six weeks. Where you are now and what progress you wish to continue to make. Each person on the course will have a different desire for their life and I will do my best to guide you towards your next best step. There will be celebrations of progress and stories to share. This will be a VERY inspiring six-weeks of your life. You will receive a certificate from the library and Happiness Millionaire to remind you of the changes you have made. 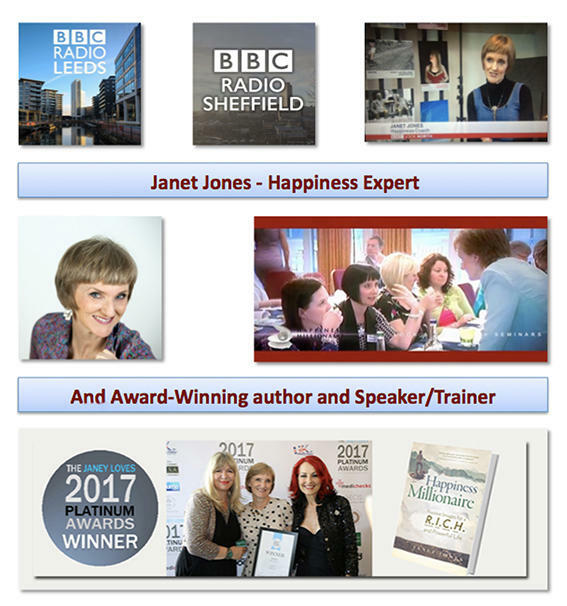 Janet Jones, founder of Happiness Millionaire Ltd, motivates and inspires people to live happier and more successfully using the Power of Positive Images. Through her discovery of how images impact our happiness and success, she soon became a leading breakthrough and happiness expert in the UK and the author of the new book, Happiness Millionaire: Positive Images for a R.I.C.H and Powerful LIFE. Janet won ‘Women Inspiring Women Award for Best Speaker/Trainer’ in 2013. Her book recently was awarded the ‘Janey Loves Platinum Award for best book category’ by Radio 2's Janey Lee Grace. Janet is also a regular guest on BBC Radio Leeds.